The Phillies mercifully finished their first losing season since 2002 and the worst record since 2000. The month started well and an 8-3 stretch put them at 9 games under .500 and 18-13 under Sandberg. 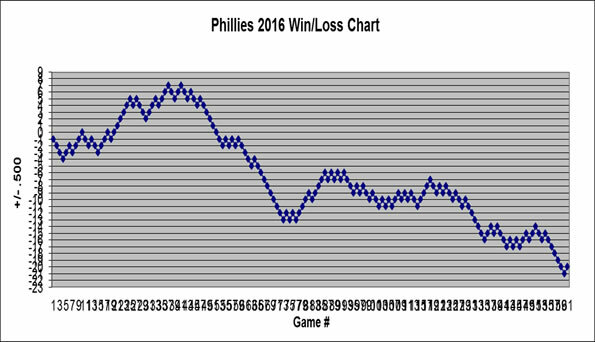 The Phils ran out of steam, though, and limped to the off season winning just one of their last five games and 2 of their last 11. Will 2014 be reincarnation of 1993 Phillies? The odds of the Phillies winning the World Series next year or even achieving a winning record are not favorable. But there is always hope, and for that we need to look no further than the worst-to-first 1993 Phillies. The 1992 Phillies finished in last place in the NL East with a 72-90 record. They ranked second in the National League with 686 runs, but their pitching finished dead last with a 4.13 ERA and far worse than the next to last team (Astros) with a 3.74 ERA. As we all know, their fortunes completely changed the following season. The 1993 Phillies won the NL Pennant with a 97-65 record. They ranked first in runs with 877 and their much improved pitching ranked 7th with a 3.97 ERA. How the Phillies were able to rebound is an interesting case because their top 5 starters' ERA actually increased from 3.60 to 3.86 and their bullpen ERA improved only slightly from 4.20 to 4.00. Last night was Craig Berube’s first game as a head coach in the NHL. It was a big game because it catapulted him to the status of veteran head coach in the city of Philadelphia. He already has more big league coaching experience than Brett Brown of the Sixers and is 27 games away from tying Ryne Sandberg for the most games coached. Chip Kelly and his full 5 games of head coaching experience is now the longest tenured coach in Philadelphia. In less than 10 months, the head coaches of Philadelphia's four major sports went from a combined 50 years of head coaching experience to zero full years. It’s not surprising considering three of the four teams finished with losing records last season (the Flyers finished one game above .500) and no Philadelphia team reached the playoffs. But to lose four coaches in less than a year is quite amazing. The change in coaching experience is dramatic. Check this out: the previous group of coaches had a combined 50 years and 3,663 games of experience in their careers and amassed 1,966 wins, 15 division titles, 5 conference titles, and 2 World Championships. As of today, the current coaches have combined for 0 full seasons, 47 games, 22 wins, and 0 titles. Let's see it in table form. Here are the career coaching totals of the previous regime followed by the current coaches. Here also is the individual breakdown by coaches. So the dawn of a new era is upon us. I just finished putting together the Phillies 2014 schedule and I thought I would share a few (albeit not all that interesting) tidbits. Let's start with a look at the home and road comparison. It may seem trivial, but the timing of homestands and road trips can have a genuine impact on a season. Start out with too many road games and you could be buried by May. Finish with too many road games and it could cost you the season. That's why I have always been curious about how the travel schedule plays out. In 2014, the Phils have a pretty balanced schedule in April and then play 19 of their 27 games in May at home. June is a fairly even split before facing a tough stretch in July, entering the all-star break with a 10-game road trip before returning home for a series against the Nationals. The Fightins have a few more home games in August and the reverse in September. The finish to the season is brutal with a 10-game road trip which includes seven games in California before returning home for a series against the Braves. I always find the national perspective on Philadelphia sports to be an intriguing topic. In some cases the national media provides an objective view in a way local reporters who follow one team every day for six months cannot. But what the national guys offer in objectivity they lack in the genuine knowledge that only comes with the investment of time. Reading box scores and watching highlights does not make someone an expert. Peter Gammons may be the ultimate baseball guru of all-time, but he will never be more knowledgeable about the Philadelphia Phillies than the local reporter who watches each at-bat, attends each press conference, and patrols the locker room daily. If you have covered Phillies general manager Ruben Amaro Jr., even a little bit, you know that look: Eyebrow cocked, grin parting his lips, eyes glinting with the joy of imagined trades or signings. This little devil loves to do big things. I want you to look at that last sentence again. Here is a quick lesson about the unfairness of professional baseball. When the Red Sox or Cardinals win the World Series in less than two weeks, it will be their 3rd title in the last decade. If the Red Sox win, it will be their 3rd in 10 years. If the Cards win, it will be their 3rd in 8 years. Here are some numbers that prove baseball just 'aint fair. --Three of the last five World Series winners have multiple titles within the last eight years. --Of the last 12 World Series champions, 7 of them have multiple titles. --Each team should win 1 championship in 30 years on average, yet in the last 30 years, 7 teams have multiple championships and 11 teams have none. In the last thirty years, 7 teams have a multiple championships and a combined 18 titles, leaving 12 teams with just one title and 11 teams with none. If the trend over the last thirty years continues, the 23 teams with one or less championships will average 1 title in 57 years. Those are not good odds. Hey Domonic Brown, you better be careful! One of the first things a team will do when a new player comes to Philadelphia is send them to Pat’s or Geno’s. While they sit and enjoy a delicious, greasy, cheesesteak (Whiz Wit of course), they need to explain the deal with the Cowboys. The discussion is simple. If you are a Cowboys fan, don’t tell ANYBODY EVER. Clearly Domonic Brown did not have that conversation because he felt it was a good idea to tweet a picture of himself wearing a Cowboys jersey on the same day Dallas pounded the Eagles. Seriously? That’s about a 9 on the stupid scale there, Dom. DoBo learned the hard way that nothing is funny when it comes to the Cowboys. Brown was obliterated by Philadelphia fans and, of course, it wasn’t all G rated stuff. Many fans took the opportunity to send hate tweets to someone they never met for doing nothing wrong whatsoever. That’s all I have to say about that. Hey Dom. See that red, plastic, container over there? Yeah, that one with Gasoline written on it. Go ahead and dump it on that twitter fire over there.